Demi Lovato’s hair soars like a ‘Skyscraper’ and changes with the wind! Demi loves to change her hair and it shows! How do we know DLo likes to vary her hair? Because that’s what she told allure.com in an August interview. “I love changing my hair a lot,” she said. “I think it’s fun.” Here’s just a few examples of her affection for makeovers. When you see stars wearing their favorite things at different times, their hair doesn’t change much. That’s not the case with Ms. D. Two hairstyles worn with the same jean jacket make Demi look like new women. 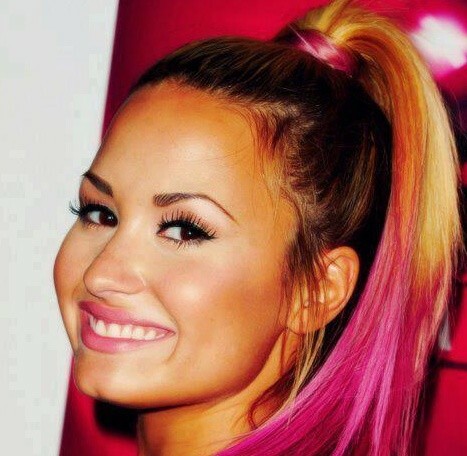 One day, she let her hair down so pink dip dye stands out. Another time, Demi is hardly recognizable in upswept curls held up with a scarf headband. Of course, sunglasses make a difference, too. BTW: notice how the ends are light blue instead of pink! As any good TV host, Demi changed her hair three times the night of the Teen Choice Awards. The two shown above aren’t that different; the second is more sedate because it’s not as high and exaggerated as her look on the pink carpet. Halfway through the show, Demi threw us a curve ball. Her mane had changed so dramatically it seemed like it had been colored back stage! We’ve heard that she simply hid the blue ends when wearing the high pony. We don’t know how she covered the aqua ends, but we’re guessing it had something to do with extensions. Our final prediction: now that her career is moving forward, there will be no turning back any time soon! This entry was posted in Celebrity Hair Color, Celebrity Hairstyles, Music, star makeovers, Teen Choice Awards, TV and tagged #DemiChangedOurLives, #DemiLovato, #DemiLovatoHair, Dip-dye hair color, Give Your Heart a Break, Hair extensions, Skyscraper song, Teen Choice Awards, Trendy hair color, Unbroken album, VMAs, Wild hair color. Bookmark the permalink.